Replace your bow roller assembly with this complete kit. 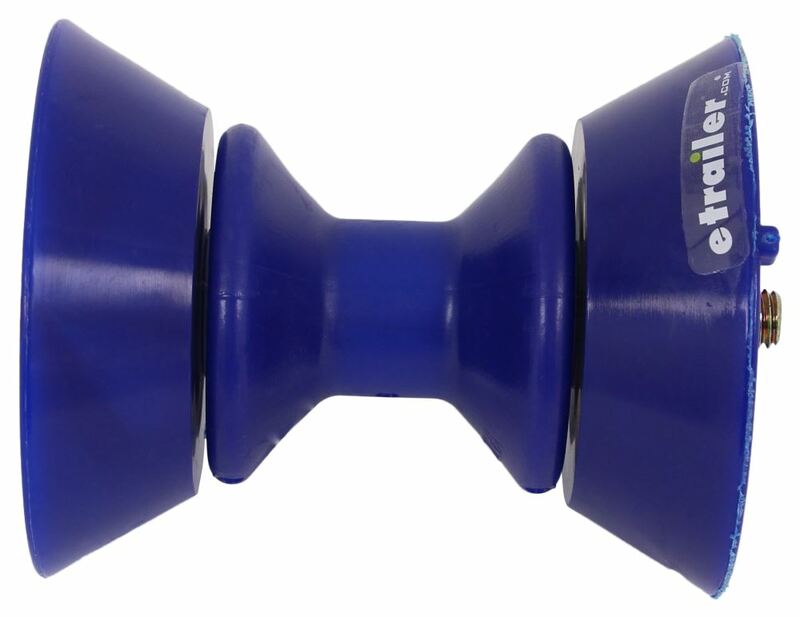 Includes a 3" roller, 2 end bells, and corrosion-resistant hardware. Blue TPR material is stronger than rubber and softer than polyurethane, and it won't leave marks on your boat. Call 800-298-8924 to order Yates Rubber boat trailer parts part number YR300B-325B or order online at etrailer.com. Free expert support on all Yates Rubber products. 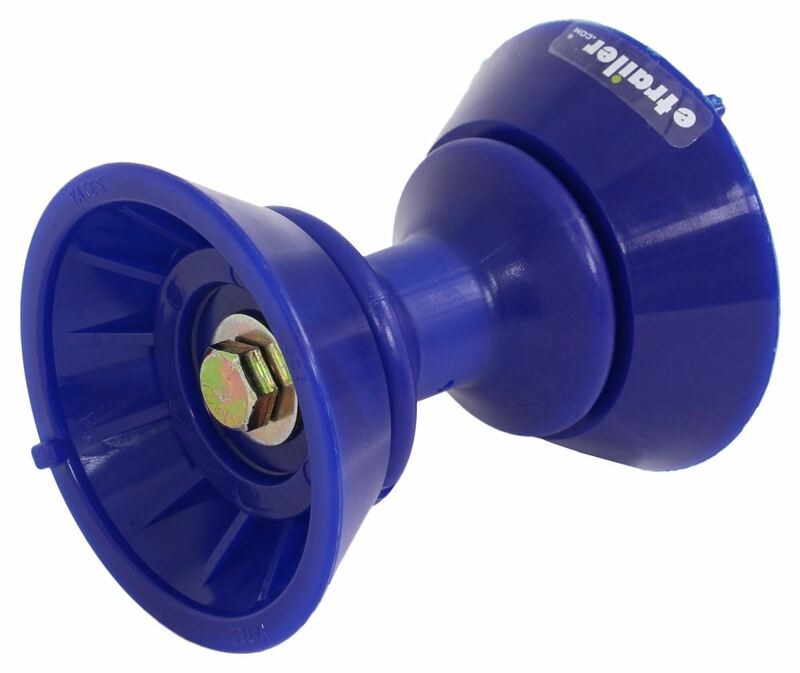 Guaranteed Lowest Price and Fastest Shipping for Bow Roller Assembly w/ Bells for 3" Wide Bracket - TPR - 1/2" Shaft - Blue. Boat Trailer Parts reviews from real customers. This complete bow roller assembly includes 1 roller with 2 matching end bells, plus the hardware you need to mount them on your trailer. Simply attach the assembly to the existing bracket on your boat trailer and you're all set! The TPR construction provides ultimate durability and strength over standard rubber rollers and will not leave marks on your boat. Replace the worn-out bow stop on your boat trailer with this heavy-duty rubber Y-stop. Stop acts as a bumper to keep your boat from hitting your trailer winch when loading. Y-shape contours to hull to help cradle boat during trailering. Male:	Today, we're going to be taking a look at a bow roller assembling. This bow roller assembly replaces the bow roller, end bells, shaft, and hardware on your boat trailer. Really helps ease loading and unloading of the boat. It's going to support the front end of the boat, as it sits on the trailer. It's going to help to absorb road shock, while the boat is being towed. 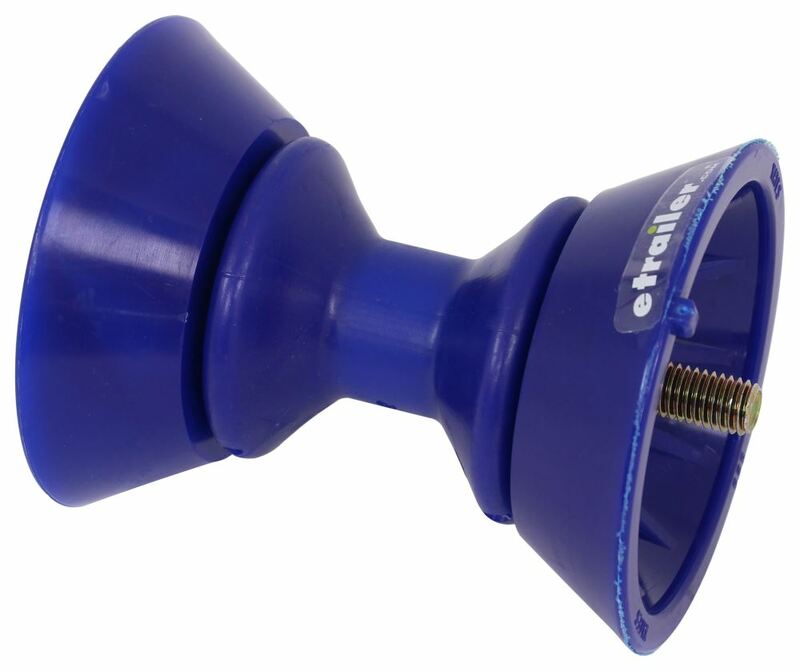 The end bells are going to insure that your boat doesn't scrape along bolts or roller brackets. The unit's constructed of a thermoplasticized rubber. That's TPR construction. It's s non-marking, non-scratching material that's stronger and more durable than traditional rubber. It's also more pliant. It's softer, more pliant than polyurethane. It's going to be blue in color. All the hardware that it comes with is going to have a protective zinc finish on it, to resist rust and corrosion. The product's made right here in The USA. This is designed to be used with a three inch wide bracket. The bracket would install in-between the end bell and the roller on each side. Brackets are sold separately. If we take a measurement of just the bolt or the center shaft, that's going to be five inches long, from the bottom of the bolt head, to the end of the threaded portion. Now, when it comes to the hardware, you're going to get the center shaft or bolt. You're going to get two flat washers, one for each side. You're going to get a nylon locknut. Taking a measurement of the roller length, just measuring that center piece there. That's going to be about three inches long. The roller itself is going to have a diameter, at the widest point, of about three inches. That's on the ends. The end bell, at the widest point, that's going to give us a measurement of about four and a half inches. Then, the diameter at the attachment point, is about three and one eighth of an inch. The overall length, without the roller bracket installed, that's going to measure right around five and a half inches long. That's going to do it for today's look at the bow roller assembly. Order: RelevanceNewestRating - High to LowRating - Low to High Replace your bow roller assembly with this complete kit. Includes a 3" roller, 2 end bells, and corrosion-resistant hardware. Blue TPR material is stronger than rubber and softer than polyurethane, and it won't leave marks on your boat.